Oh way back I had an uncle and aunt who lived in Willets and who we visited one summer. This brought back wonderful memories of a long-ago road trip. These historic train rides are so much fun, aren't they!? I'd love to take this ride someday. What a great ride that would be...on a historic train though it may no longer bear the trademark smell! I love train rides, especially historic trains. It would be great to take the dinner excursion! The BBQ Dinner Excursion sounds like a really fun family experience! 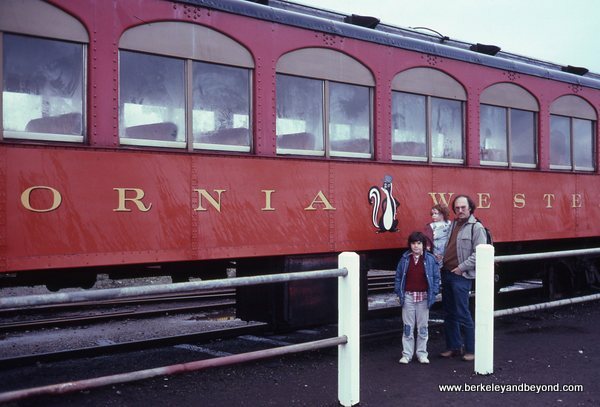 Love vintage train rides- the Skunk Train looks like great fun! I love vintage trains too! I haven't done the Skunk Train, but I think my most memorable was the Jacobite Steam Train in the Scottish Highlands. It's the one that was used as the Hogwarts Express in the Harry Potter films.